Angora is literally the newest mutation of rats on earth right now. So not much is known. Its genetically a Harley but it's also curly and has a different feel to the coat. It's the softest coat type. It's so soft you almost can't feel it. 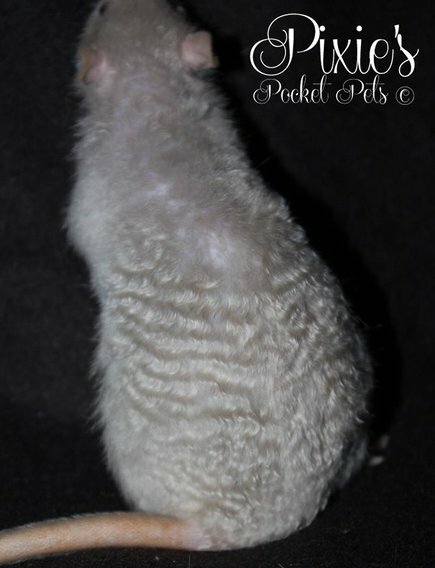 So Angora is a soft long coated rat with a tight wave or curl and it shines like a Satin mouse. The gene was first mutated at Pixie's Rattery in Canada and she shipped them to me. She named them Angora as that is her right to do so. It was thought by Pixie that the curl may come from a Satin gene she has in the line. But she wasn't sure. So she sent them to me to work on and figure out. This is not the same Satin we are used to in the Western United States. We have AFRMA Satin here (the correct Satin gene and term for the Satin coat) and that looks like Harley. AFRMA Satin has no shine. This is a short coated Satin from the Eastern United States which might have been in the Angora line. I really don't think they should call that Satin because its not the same gene as real Satins. However from the breedings I have done and the ones done by RuBY Rattery, we have discovered that there is no Satins popping up in our litters. So the gene simply isnt present. So that is not what is causing the curl. 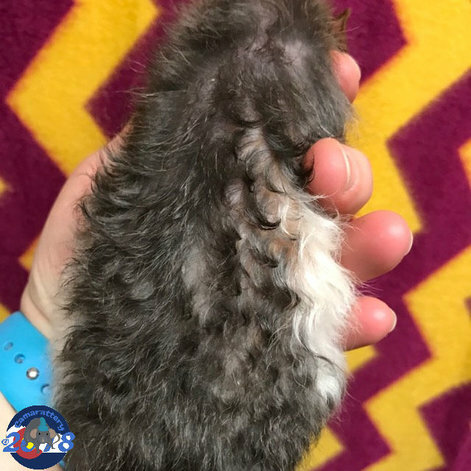 Even if we breed and Angora to a standard rat carrying no other coat genes, and breed those Angora carriers together, there is never any Satin there. Its only Angora and Standard coated babies. Angora babies do not have the curl that the adults do. This comes as the rat molts into the adult coat. As babies they have long straight hair with a wave. The whiskers are long and curly. Unlike the Harley which are long and have a slight wave or bend. Pixie exported Angoras to me. Emerald City Rattery did the import and sent all Angora straight to me. I was the 1st to get them in the USA. I got 2 of them and male, and the female pictured above. Unfortunately she died in labor the 1st time I bred her and I never got any babies from her. So I had to start my line with the male who wasn't as good of an Angora. I have since then shared them with 2 other ratteries. And we have had quite a few litters with this line now. 1) Angora is a mutation of the Harley gene. It is genetically Harley with either a modifier or another recessive gene attached to it. I am unsure which. 2) There has never been any Satin born in our litters. So the rat I started with didn't carry the gene. Satin is recessive and so is Harley. So technically my 1st Angora should have thrown Satin to every baby he had if the Angora was mixture of Satin and Harley. However I did breed him to 2 standard haired females, we kept all of those babies (so quite a few) and bred all of those babies together. None of the grand babies were Satin. They were a mixture of standard hair, Angora, and Harley. 3) What we know is that the mutation started when the line from RMBL Nanuk a Dumbo-Eared Seal Point Siamese Self Satin Harley (from Holland imported parents) was bred to a German imported line from a rat named 30 Seconds Titan. 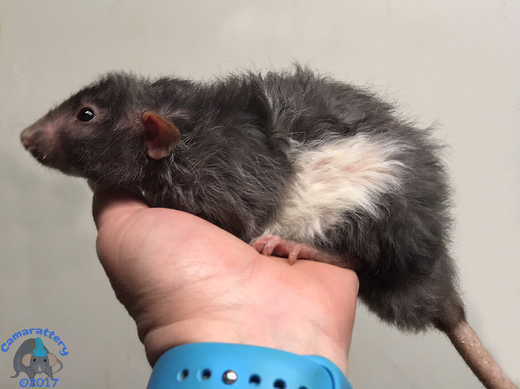 A Black Berkshire wavy looking Harley. When the 2 lines were mixed, the Angora gene was mutated. We also know that the Nanuk line has had lactation issues and skin issues. The Titan line does not. 4) Emerald City Rattery with the prefix RuBY also imported some Harley and carriers of the same genealogy both Nanuk and Titans line to the USA from Georgian Bay Rattery in Canada. She then bred those Harley/carriers together and it seemed that the babies were all standard hair and Harley. So she sent me one of those Harley his name is RuBY Phoenix Cama. Hes a Black Whiteside Dumbo. I wanted him for his Harley gene. This is his baby picture to the right. I wanted to start a Harley line with him. But after he became an adult I started having conversations form RuBY about how his coat was changing. It never got thin or scabby, which was a good thing (as we had issues with that in the past out of the Nanuk line we had previously) but it was getting wavy. Very slowly. And every time he molted this wave would get tighter until eventually it was a nice curl. Apparently he was an Angora! And the nicest one I have. But that is also because he is the oldest and hes had more time to curl. The rest of my Angora are half his age and still have the lesser wave. His adult picture is above to the left. You can see the huge difference between his baby pic and the adult pic. He will now be used to better the Angora that I have been working on. He has the gene for good coat without skin issues. So that is a definite plus. And since I feel bad that RuBY sent me an amazing Angora without knowing, after I breed him I will let her have him back for some breeding's. Phoenix will be a benefit to my Angoras for more than one reason. I had decided early on to breed the Angoras for Whiteside and they are that pattern not or carry it. Coincidentally I originally didn't need Phoenix for his WS gene since I only wanted his Harley coat but since he is also a Whiteside that will be a bonus. He will fit right in. 5) Angora doesn't need Satin in the line. The line I got from Pixie didn't carry the Satin as mentioned above. At least the one male I bred didn't. And they have made nice Angora's. However when speaking with Georgian Bay, her line does seem to throw Satin's. So Phoenix probably carries it. And I will find that out once I start breeding him. So Angora does not need the Satin gene. But coexist's with it just fine if its in the pedigree. It doesn't seem to detract form the coat. My plan is to breed him to my Whiteside Russian Blue Angora girl. See what I get there. I also want to breed him to a standard hair from my WS line. Those don't carry any coats. And I want to breed 2 of those babies together. This will tell me if he has Satin in there. Also this latter breeding will give me a line not so closely related to my Pixie Angoras. I want to explore the differences between the 2 lines. He started out straight coated, then he was wavy, and as an adult he has a tight curl. You can see why we thought he was a Harley as a baby. This is how the Angora gene works. Effective immediately here at Camarattery I am no longer going to breed the Angora line that came from the import from Carol. This line has been too problematic and gets worse each generation. This line has constant failure to thrive, and constant infections in the mouth and ears. So I will not continue it. 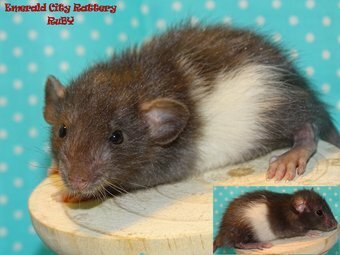 I will only breed from the line from Georgian Bay Rattery from my male Phoenix and see if that gets better. He at least has never given me any health issues.